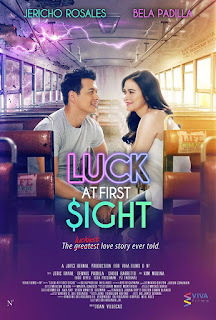 Luck at first sight, a romantic-comedy movie starring Jericho Rosales and Bela Padilla. 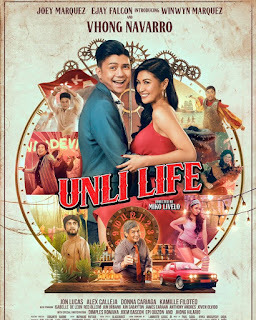 Produced by Viva Films and directed by Dan Villegas. Released last May 3, 2017 in cinemas nationwide. The story revolves around Joma (Jericho) who seeks a life charm to be able to win money through gambling in order to pay his debts. Upon seeking his luck in many ways, he met Diane (Bella) who turn out to be his lucky charm whenever the two are together. In the story, Diane agreed to Joma's proposal of joining together every time he gambles and they must share the winning money equally because Diane needed the money as well in order to pay the hospital bill of her father. Along the way one of them falls in love with the other that resulted to bad luck. What will the two will choose? Luck or love? The movie depicts a direct and simple story, that love prevails fortune. Love is selfless and giving more important than any wealth. I recommend this movie, Luck at first sight for all movie goers. It will make you laugh and love.